← Jesus is the program, the teaching, and the spiritual life! Yesterday I received a gift in the mail. 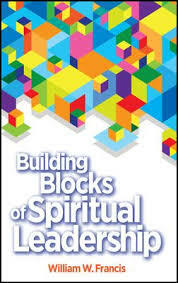 It is a new book called Building Blocks of Spiritual Leadership by Commissioner William W. Francis (retired commander of the Canada and Bermuda Territory of The Salvation Army) published by Triumph Publishing and Crest Books. As I read it, I found several passages that inspired me in my vision of seeing the spiritual method of 1 Corinthians 14:26 released in The Salvation Army and in churches of every type around the world. “As Jesus sacrificed His life for the redemption of creation, so the offering of our lives as His coworkers must be characterized by a divinely inspired zeal to accompany, lift up, support and nurture God’s people. Such a leadership model is radical, countercultural, transformative, and ably articulated by Commissioner Francis, whose book I am most pleased to endorse.” –General André Cox, International leader of The Salvation Army. –So why do we work so hard to defend the status quo and keep it from changing (especially in church)? –Why not let ordinary people speak out in church meetings as they are led by the Holy Spirit, according to the Bible verse 1 Corinthians 14:26? Participatory church is about pastors focusing on what ordinary people can share and accomplish in a church meeting, rather than keeping center focus on their own preaching. –Here’s a challenge for pastors along those lines: A Challenge For Pastors In 2015 #2 (Let the living Jesus lead a church meeting). What if we made the Holy Spirit our featured Sunday morning speaker? “Whoever has ears, let them hear what the Spirit says to the churches.” Perhaps a church meeting could have many mini messages by many different people rather than only one single sermon by only one ordained man called the pastor. (See 1 Corinthians 14:26.) That’s our goal at The Salvation Army Berry Street in Nashville, Tennessee. If you are ever in the area come see: Sunday mornings @ 10:45, 225 Berry St., 37207. This entry was posted in alternative church, books, building blocks of spiritual leadership, Canada, Commissioner William Francis, Crest Books, Nashville, Quotations, Salvation Army Corps, territory, Triumph Publishing, USA, William W. Francis and tagged book review, church, General André Cox, leadership, quotes, spiritual leadership, The Salvation Army. Bookmark the permalink.